Middlesex University has launched the North London Social Work Teaching Partnership, a national project funded by the Department for Education in order to build excellence in social work teaching and practice. It aims to improve the training, recruitment, progression and retention of social workers across north London while enhancing the innovation and creativity of the service through the sharing of knowledge and research. Led by the London Borough of Hackney, the Partnership also includes the local authorities of Barnet, Enfield and Haringey alongside the leading charity, Norwood, which supports children, families and people with learning disabilities. The Partnership’s inaugural event was held at Middlesex on Tuesday 31 October, and shared some of its key findings and achievements to date. 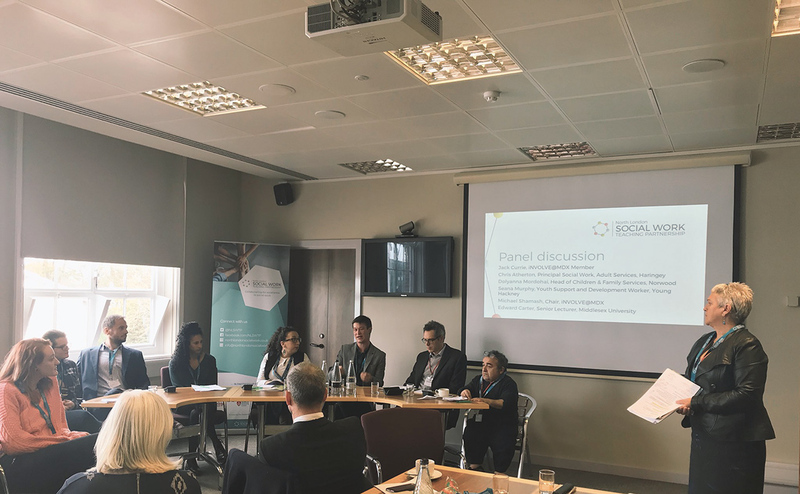 Speakers included Professor Tim Blackman, Vice-Chancellor of Middlesex University; Dr Adi Cooper OBE, Co-Chair of the Association of Directors of Adult Social Services; and Dr Patricia Cartney from the University of Manchester. Middlesex Pro Vice-Chancellor and Dean of the School of Health and Education, Jan Williams, said that the Teaching Partnership recognises the University’s values of putting its students first, working collaboratively, act with integrity and shaping the future. “I am delighted that we are partners in this initiative,” she said. “It will enhance the experiences of our students, allow us to share best practice in working with communities, and improve employment opportunities for the benefit of all. Anne Canning, Group Director: Children, Adults and Community Health at the London Borough of Hackney, argued that building closer links between students and practicing professionals better equips aspiring social workers for the challenges of social care. “As well as providing development opportunities for senior practitioners, students benefit from mentors in the field and the scheme enables them to embark on a defined career pathway,” she said. The North London Social Work Teaching Partnership also promotes the use of research for local practitioners in order to support their skills development in addition to providing postgraduate qualifications at Middlesex University. Experienced practitioners will also be supported with opportunities to deliver lectures and learning symposia on a number of topics in the field, building upon the commitment to share best practice and knowledge across all partner organisations and ultimately improving outcomes for communities in North London.